When I first got the box of cotton swabs/buds/q-tips(whatever you called it, I will call it q-tips in this post), it is well wrapped up in a plastic wrapper. The box of q-tips comes with a lock tab lid(?) design to secure and prevent the box lid from opening itself. 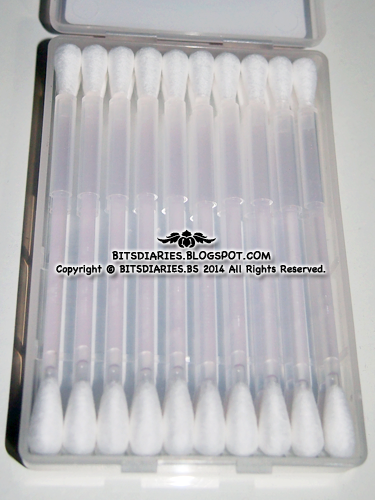 The q-tips are neatly packed in a compact-size plastic box. The q-tips are different with the ones we normally use in our life. 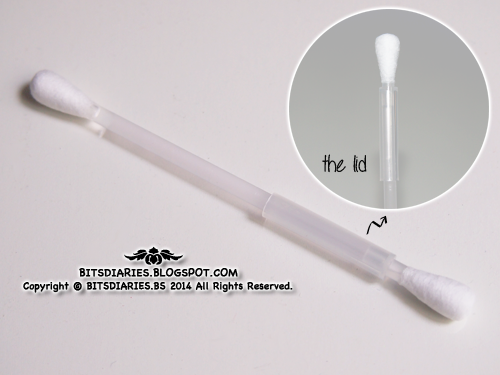 Each of this q-tip is filled with makeup remover in its stem and when you twist and pull off the lid side, the makeup remover will flow down through its stem to the opposite end, damping the cotton. While the cotton on the lid side remains dry. After removing the makeup smudges with the damped side, you can use the dry side to absorb any excess makeup remover or residue on your skin. 1) Hold the bar vertically with the lid side facing upwards. 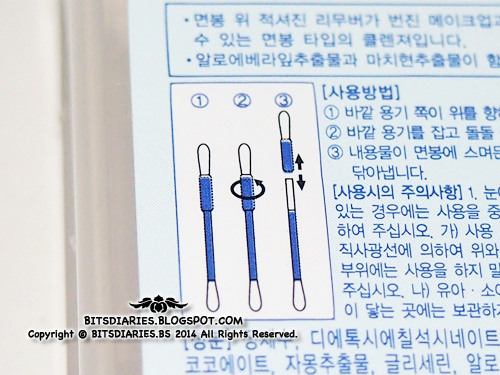 3) Once the lid is pulled off, the makeup remover in the stem will flow down and damp the cotton on the other end. I thought actions would be much clearer than non-animated pictures and words hence, I recorded a video... A muted one lol. Hopefully, the actions in the video will explain clearer on how effective these q-tips work. On a side note, you can change the video quality by going to the gear icon(setting) in the corner of the video player, and select your preferred quality. 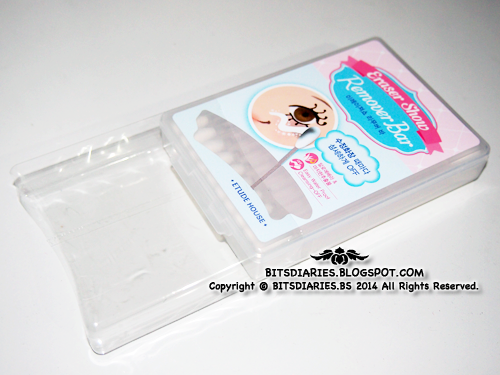 As seen in the video, I did have a slight problem erasing the Holika Holika Jewel-like Waterproof Eyeliner... I guess...maybe I applied way too many layers. FYI, I applied 4 layers of Holika Holika Jewel-like Waterproof Gel Liner, 2 layers of Dollywink Liquid Eyeliner and 2 layers of The Face Shop Make Me Star Waterproof Gel Liner. Anyhow, I guess that's not a big problem as these remover bars are meant to cleanse up smudges and not the whole eye makeup. 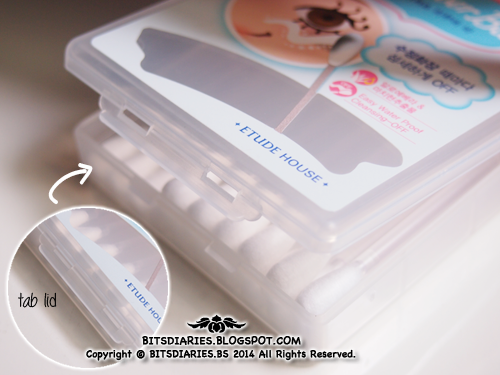 In the video, I show you on how to release the makeup remover to the cotton tip and also how effective the damped q-tip cleanses makeup but err...something is missing. I forgot to show you the part on how to use the dry side. But well, I think you should know what the dry side is for huh? I mentioned just now though, but it's okay, I will repeat again~ FYI, the dry side is for removing excess makeup remover or residue that are on your skin after you cleansed the smudges. The makeup remover in the stem of the q-tip is in liquid form. It's colorless and non-greasy. It has a pleasant mild scent. I don't really know how to describe the scent but don't worry it doesn't smell bad or overpowering! - packaging! - lightweight, compact size, comes in a box etc. - easy to use; mess-free! 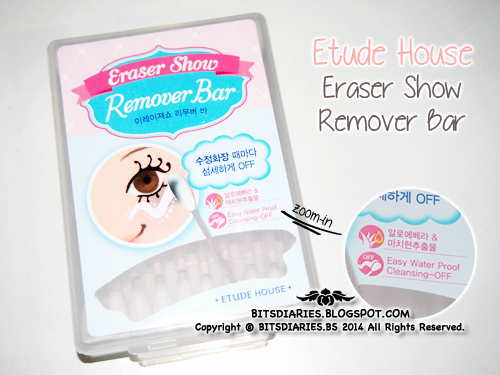 Verdict: Seriously, there's nothing I dislike about this Eraser Show Remover Bar! It is gentle, non-greasy and does not dry out the skin yet it cleanses makeup smudges effectively. Best of all, the box of q-tips is lightweight hence, it's very convenient to carry it wherever you go! 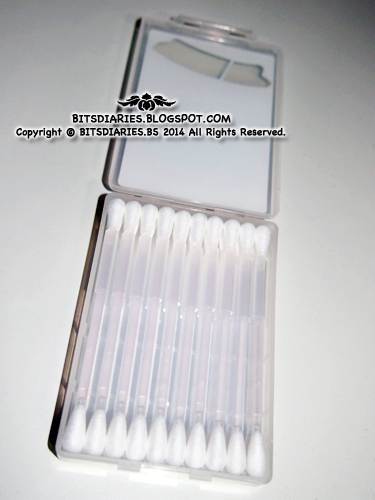 I always bring a box of these q-tips in my bag because I know it may come in handy, fixing makeup imperfections. Definitely a must-have item! omg thats soo cool and handy! !